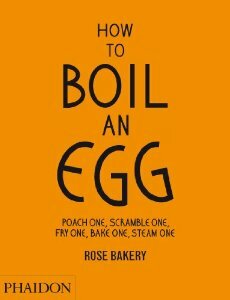 We were so excited to get a copy of How To Boil an Egg by Rose Carrarini from the Rose Bakery. Then we were saddened to learn that we had never written about Rose's first book, Breakfast, Lunch, or Tea. What were we thinking? How did that one get away? Well perhaps tomorrow. Today we are looking at How To Boil an Egg. If you read this blog you know we have a stacks of "how to" egg books. I will be the first to admit that they are often quite repetitious, which is odd given all the things one can do with an egg. There are indeed plain egg recipes. There are muffins and scones that use eggs, tarts and quiches. An occasional flan. Since these recipes were garnered from the Rose Bakery, there are many recipes that fall into that lunch and tea option. Carrarini shines with sandwiches and soups. The Hot Tofu Pot is not what one thinks of when one heads into a bakery, but on a cold day, what could be better. Pour the stock into a pan and bring to a simmer. Add the onion, leek, celery and carrot and simmer for about 5 minutes. Add the cabbage and turnips and cook for an additional 5-10 minutes, until just tender but not overcooked, then add the tofu and warm through. Season to taste with shoyu and salt and pepper, if necessary, and add the chives. The eggs may be fried in olive oil or butter or added to the pan and poached. Transfer the eggs to 4 individual bowls, ladle in the stew and serve immediately with a hot chili sauce, Japanese chili powder, or Dijon mustard. How To Boil An Egg features the work of Fiona Strickland, a botanical illustrator from Scotland. She has captured many of the Rose Bakery dishes with eerie calm. At first glance they seem like photographs. It might not have been such a great choice. Frankly, it seems hard to imagine that the food could possibly live up to the illustrations. And then you read the recipe for the Welsh Tea Cakes or the Mashed Potatoes, Eggs and Parmesan and all you want to do is break a few eggs.